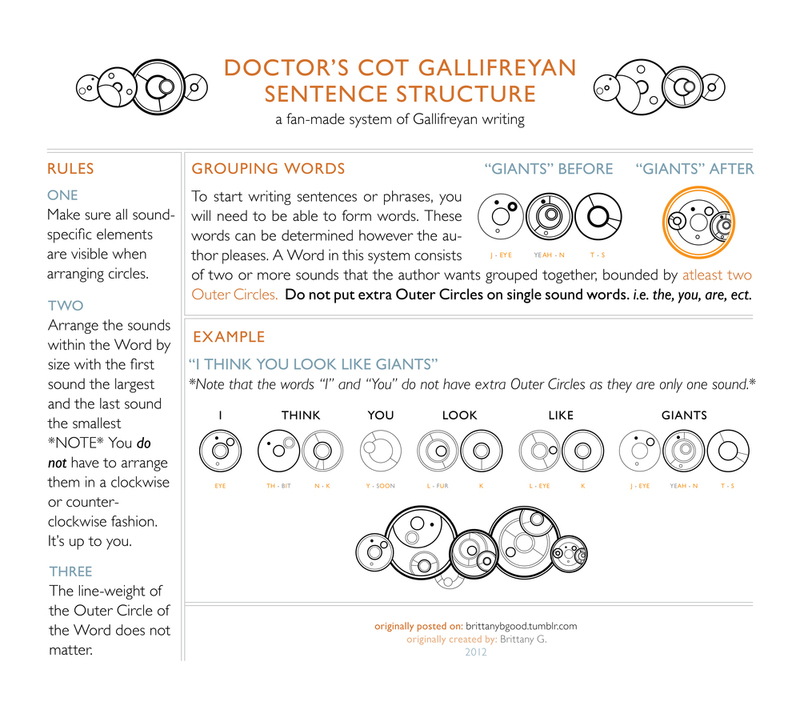 After much planning and sketching and trials, the first version of the Doctor's Cot Gallifreyan system was released. It started with my love for languages and Doctor Who and one of my favorite languages, Hebrew. The system got it's structure from Hebrew. There are no vowels, just consonants that the vowels can attach to. So, in Hebrew, a word like "shalom" is actually written as "shlm". This idea made sense because human language pairs sounds together in syllables. Some words are more complicated than others but most syllables involve a consonant and a vowel. Given the circular nature of Gallifreyan, this gave me the opportunity to layer in multiple consonants and vowels into one circle. One thing that I noticed with the systems is that some of them didn't look screen accurate. My favorite sample was from the Doctor's cot in A Good Man Goes to War and so, as I was creating this system, I strived to focus on those elements in that sample and create a visual language that was as close as possible to the examples from the show while still actually working as a system. After a month of translations, I realized that I forgot a vowel sound and so I added it to the system in one of the open vowel slots. Previous requests were just of help with different words or specific sounds but the first official public translation request along the lines of "Could you translate..." came in on June 4th, 2012. This was the first problematic vowel I ran into. I didn't know it at the time but I was dealing with the schwa vowel which actually varies depending on the language and is very hard to explain in English. With users wanting to translate longer phrases and sentences, a grouping system for words was put in place to condense the design. The grouping system is optional and not mandatory, it can just help clean up designs. In honor of my 100 followers, I decided to take on a rather large translation. I chose to do the poem/song "O Mistress Mine" from Shakespeare's Twelfth Night because the final goodbye with one of the Doctor's companions, Rose, was in the episode Journeys End. The line it takes it's name from is "Journey's end in lovers meeting, every wise man's son doth know." The translation took me about 45 minutes or so to do but I made the video x3 faster to make it a more manageable 16 mins. There was no audio as I don’t like the sound of my own voice. To help regulate the amount of length of translation requests I was receiving, I created Translation Thursday which limited the requests to three a week and kept them no longer than 12 words. I was starting to basically get paragraph long requests in my inbox and I wasn't able to keep up. This new version is an expanded version of the previous system, except converted to IPA. The old system is still compatible but this newer version is more phonetically accurate. It was released with links to outside sources to help with IPA sounds as I was still working on the American English guide. To expand this properly, two new line weights had to be added as well as four new consonant decorations and one new vowel placement. The rules were updated and made to be more clear and the description as edited as well. This is the first request since the publishing of the new system and redefined the layout in which I made the translations. This also shows how the system works with a different language. These sheets were designed for people to download and print off and practice breaking down words and phrases and hand-drawing them out. 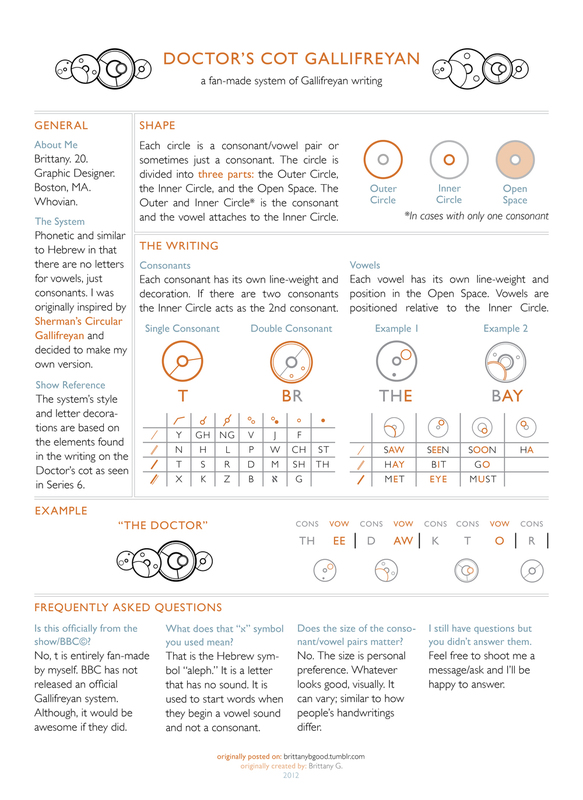 Due to very popular demand, the American English guide was released. 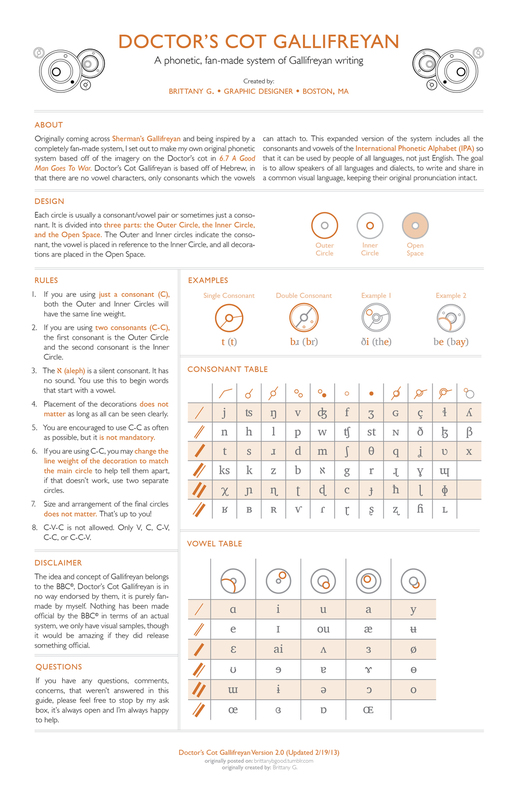 This guide switches out the IPA symbols for American English approximates. Many people had asked about punctuation so I responded with this guide. It only deals with audible punctuation. So the apostrophe in "can't" wouldn't be used because it is pronounced like "cant" but rather is used for audible stops. You can hear the inflection in exclamations and questions and when people list things, and end sentences, so all of those are included. 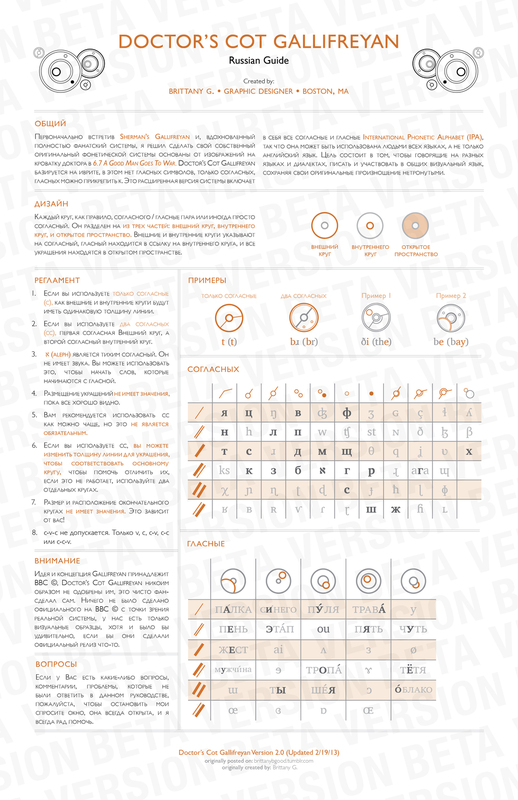 This guide also allows users to write in any direction with the addition of a "start" element. I conducted a language poll on my blog and found that there was a strong contingent of Russian speakers who liked my system. Since I don't speak Russian, I got as close as I could to a functional guide and then released it as a beta to my Russian followers to try out.